Adenoviruses most commonly cause respiratory illness; however, depending on the infecting serotype, they may also cause various other illnesses, such as gastroenteritis, conjunctivitis, cystitis, and rash illness. Symptoms of respiratory illness caused by adenovirus infection range from the common cold syndrome to pneumonia, croup, and bronchitis. Patients with compromised immune systems are especially susceptible to severe complications of adenovirus infection. Acute respiratory disease (ARD), first recognized among military recruits during World War II, can be caused by adenovirus infections during conditions of crowding and stress. What is an Adenovirus Infection? Arc Bio today revealed the second offering in its Galileo product line: a comprehensive next-generation sequencing test for the monitoring of post-transplant patients. 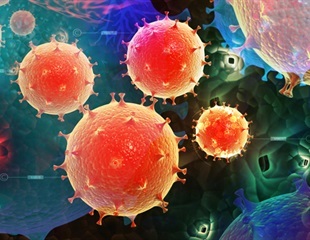 Vaccines that induce protective T-cell responses could protect against members across the filovirus family, according to a study published February 28 in the open-access journal PLOS Pathogens by Tomáš Hanke of the University of Oxford, Bette Korber of the Los Alamos National Laboratory, and colleagues. Researchers at Cardiff University have used x-ray crystallography and computer simulation to get a closer look at how viruses bind cells and cause infection. A new study has found that a childhood stomach bug may be the cause of celiac disease later in life. The findings could pave the way for a vaccine to protect against the disease. An engineered virus kills cancer cells more effectively than another virus currently used in treatments, according to Hokkaido University researchers. As a leading global city with a high population density, Singapore is vulnerable to the introduction of biological threats. Initiating an early emergency response to such threats calls for the rapid identification of the causative agent. Voorhees Pediatric Facility, a pediatric special care nursing facility located in Voorhees, New Jersey, has had four patients with chronic lung disease contract a mild form of adenovirus. The Walter Reed Army Institute of Research this week administered the first vaccine in a Phase 1 clinical trial to evaluate the safety and immunogenicity of a Marburg vaccine candidate in healthy adult volunteers. Treatment with a HER2-targeted therapeutic cancer vaccine provided clinical benefit to several patients with metastatic HER2-positive cancers who had not previously been treated with a HER2-targeted therapeutic, according to data from a phase I clinical trial presented at the Fourth CRI-CIMT-EATI-AACR International Cancer Immunotherapy Conference: Translating Science into Survival, held Sept. 30-Oct. 3. A quick and easy test for viral infections can reduce unnecessary antibiotic use and hospital admissions, according to new research presented to the European Respiratory Society International Congress today. Dr. George Tetz discusses the discovery of prion-like domains in eukaryotic viruses, and the implications of this study on gene therapies and common neurological diseases such as Alzheimer's Disease. A team of researchers from Finland and Britain have shown that over half of all the trays or security bins that the airport authorities use at the security clearance areas carry viruses that can cause respiratory infections. A new study reveals a previously unknown mechanism that governs whether viruses that infect bacteria will quickly kill their hosts or remain latent inside the cell. The discovery, reported in the journal eLife, also may apply to viruses that infect humans and other animals, the researcher said. An estimated 2.3 million people globally are infected with both human immunodeficiency virus type 1 and hepatitis C virus. Ludwig Cancer Research and the Cancer Research Institute announce the initiation of a clinical trial to evaluate the combination of ONCOS-102, an experimental anti-tumor virotherapy, with the checkpoint blockade antibody IMFINZI (durvalumab) for advanced ovarian and colorectal cancers. Biomedical engineers at Duke University have used a CRISPR/Cas9 genetic engineering technique to turn off a gene that regulates cholesterol levels in adult mice, leading to reduced blood cholesterol levels and gene repression lasting for six months after a single treatment. Adenovirus is a common virus that causes infectious diseases of the respiratory tract, eyes and gastrointestinal tract in humans and animals. Researchers at Umeå University study molecular mechanisms of infection in order to understand how adenovirus causes disease. BD (Becton, Dickinson and Company), a leading global medical technology company, today introduced several new informatics and automation solutions for clinical laboratories, which may play a critical role in the fight against infectious diseases and antimicrobial resistance. In a research article published in EMBO Molecular Medicine, a group of scientists at the University of Oxford have described a new twist on cancer immunotherapy, combining two independent cell killing approaches in a single therapeutic with high potency and broad applicability. Pancreatic cancer is one of the less common but deadliest cancers. Modified oncolytic adenoviruses represent an alternative to chemotherapy and targeted therapies, which have a high mortality rate.